Critical thinking is a process consisting of analysis and evaluation in order to solve problems and to make decisions. 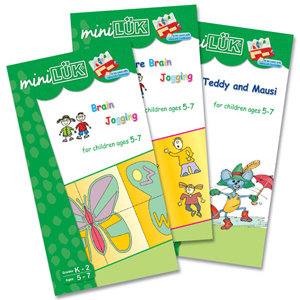 Exercises in these 3 wordbooks help children develop their problem solving skills, logical thinking and reasoning, and visual thinking ability. Teddy and Mausi are two good friends who take children into a world of fun learning activities. The vivid illustrations and well-designed contents help children enhance their essential thinking abilities during this important developmental stage. This workbook covers important learning skills including memory training, visual perception, concentration, observation, recognizing, and sequencing. During the primary elementary school years, children begin to develop critical thinking abilities. It is important to provide proper educational materials to foster their development during this stage. These brain jogging exercises are designed for such purpose. This workbook includes proven and effective exercises to advance children's critical thinking abilities as well as memory and visual perception.